Copiers are an investment in your company that make a positive impact on your productivity, ability to disseminate information and create valuable printables for your employees and clients. When your copier isn’t working, your company loses valuable time while waiting for it to be fixed. But if you’re finding that your copier is down more than it’s up and running, it’s time to consider the possibility of replacing it. Premier Business Technologies is a Baltimore area copier rental, copier lease, and copier supplier. We also offer copier service to ensure that your invaluable business equipment is working optimally and efficiently. 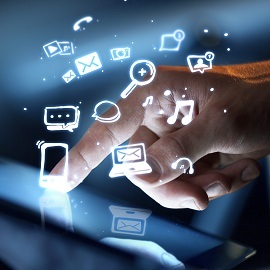 When you need to consider your business technology or need a repair, contact us today! Worried that your copier is on its last legs? We know the signs that your copier or printer is in need of a replacement. Read on to learn more about the signs, and contact us for a quote! If your copier or printer is broken more often than it’s not, there are two things to consider. 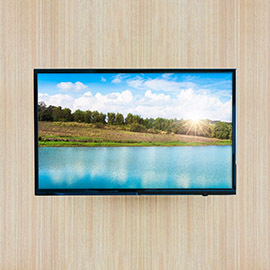 One is that the company who is servicing and fixing it is competent. They might not have enough experience to fix your particular machine, so getting a second opinion on your issues could be warranted. If your second service company still isn’t able to resolve the issues, you will likely need to consider replacing the machine altogether. We know all about the latest and greatest technology, and understand that you might not absolutely need to keep up with every new development in copiers. However, when you’re dealing with a machine that’s been running for over five years and it’s not performing as it should, it’s likely that it just needs to be upgraded to a new machine. Ten years is the maximum number of years it should run before you replace it, but five is the average age for when a copier should be replaced. The money you’re spending on service and new parts will eventually cost more than the machine is worth. When you’re unable to pay for the full price of a new machine up front, you can always consider leasing one from us for a monthly fee! When you purchased your equipment six or seven years ago, it’s possible that you had fewer people on staff and demands that weren’t terribly high. However, if you’ve grown as a company and now have more people printing more documents, you could be exceeding your machine’s monthly duty cycle. The monthly duty cycle is the number of copies/print jobs your machine can do. If you’re pushing it to the brink or over it completely, you need to look at a machine that’s built for higher performance to keep up with the demands of your growing business. To go with that, it’s possible that your staff is wasting too much time waiting for the copies to print. You don’t want your employees to have to stop or slow down for anything. When they’re spending more time in line waiting for copies than they do at their desk, that’s reducing your company’s efficiency. You might be surprised to hear that a copier can be hacked and the information that’s sent to it can be accessed. Cyber criminals who can access your network (which can be surprisingly easy if you’re not dedicating enough to secure it!) just have to get into your network to access your company’s sensitive information. Even if you’ve taken care to secure your computers and other information, one element that’s commonly and easily overlooked is the copier/printer. If yours doesn’t have the latest security measures built in, you’re putting your information, as well as your clients’, at risk. If you take a look at the energy your copier uses, you might feel a bit of sticker shock if you were to analyze how much of your energy bill it comprises. Copiers and printers are workhorses in your office, and run the bulk of the day. If they’re sucking energy, you’re wasting money. Replacing your old, inefficient machine with one that is energy-efficient will use less electricity and save on your energy bills. Especially in cases where the documents you print are sent to clients, you need printouts that are crisp and readable and that reflect your professionalism. When you hand out blurry documents, you’re not putting your best foot forward, and you’re not creating documents that are easily read by employees and clients alike. Additionally, your printer might not print anything at all. 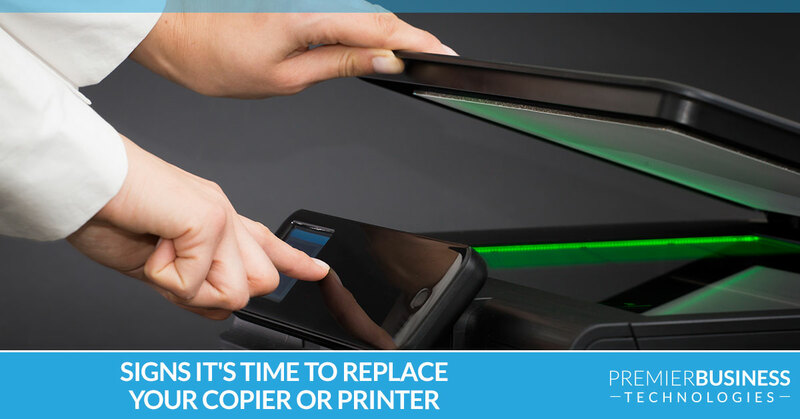 When you’ve reached either of these points and your copier service company is unable to definitively resolve the situation, it’s time to look at an upgrade. 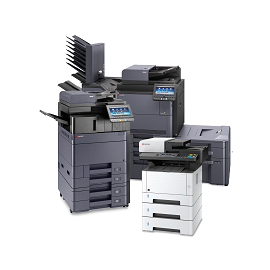 Premier Business Technologies offers copier service, repair, lease, and rental options. 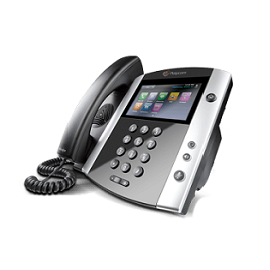 And if you’re in need of VoIP, business Internet, and business cable, we provide those services as well. Contact us today for a free copier quote for your business!